In this article, I will be expalining how to create cheque liability or request for any kind of payments like RD withdrawal, PPF withdrawal, PLI payment etc. 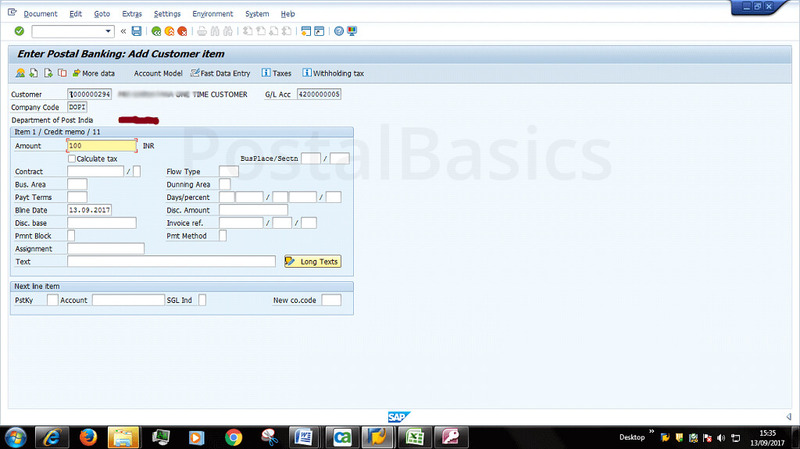 When we have to do a payments through cheque, we have to create a cheque request in SAP module. After this request, Treasurer will issue the cheque to customer. 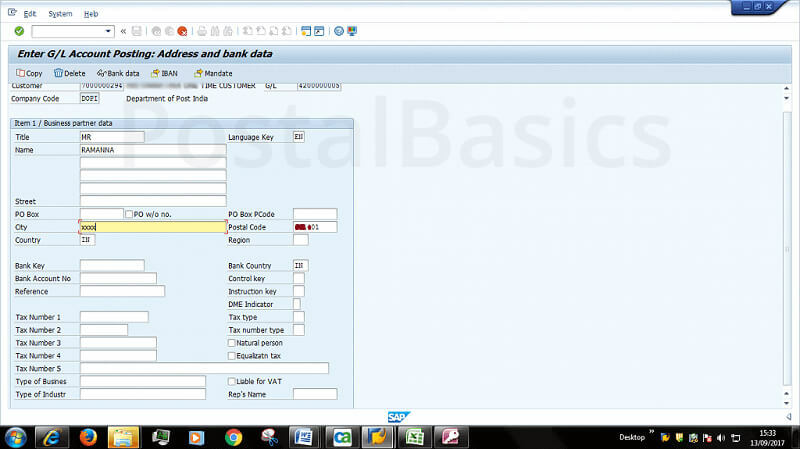 Here is the procedure to create a cheque request in SAP module. 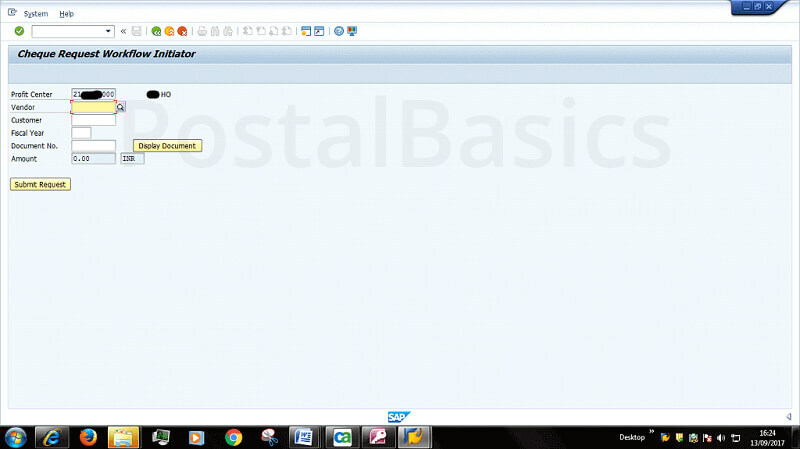 Go to SAP module. Enter T-code F-02. The below window will appear. In this window, enter the following details. Now, you will see the below screen. Click on MORE. Now, you should see the below screen. Here, enter Profit Center Number. Click on ✓ mark. Now you will see the next window. Account One time customer GL code(It may vary for circle. Here I have taken it as 1000000294). Now, hit ENTER. Next window will pop up. 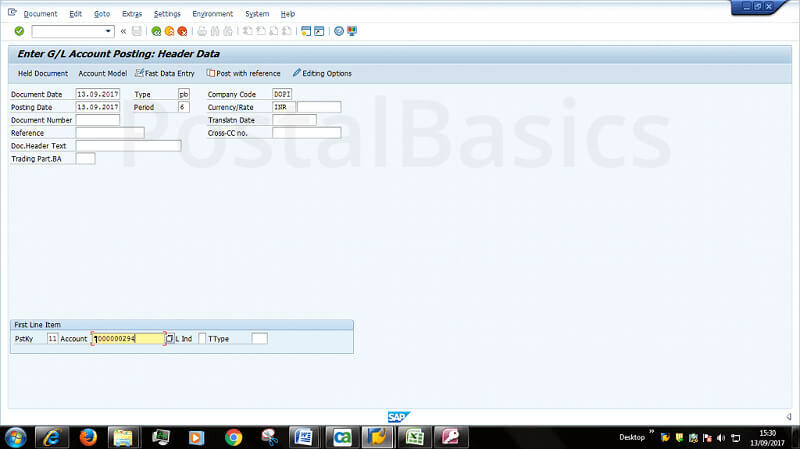 After entering the Postal code hit ENTER button. You will see this window. Here you have to enter the Amount again. 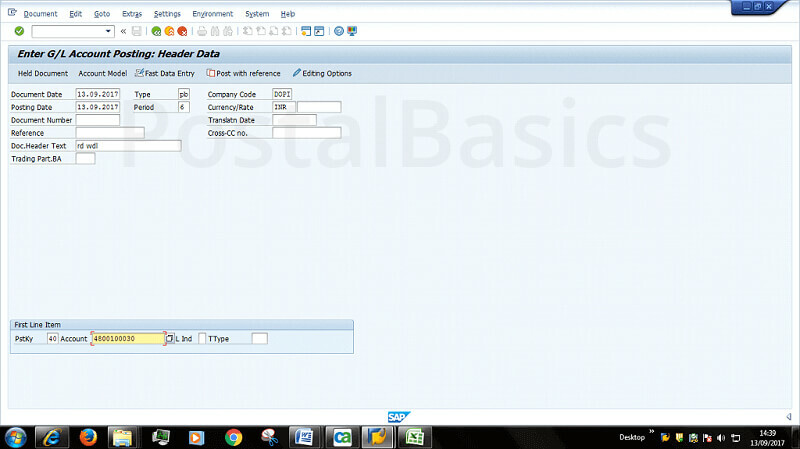 Go to Document » Click on Simulate as you see in the below screenshot. Once you have confirmed the amount and GL heads, click on SAVE button. A Document number will be generated, please note down the number. The Treasurer will issue cheque for the particular payment which will be explained in the next section. 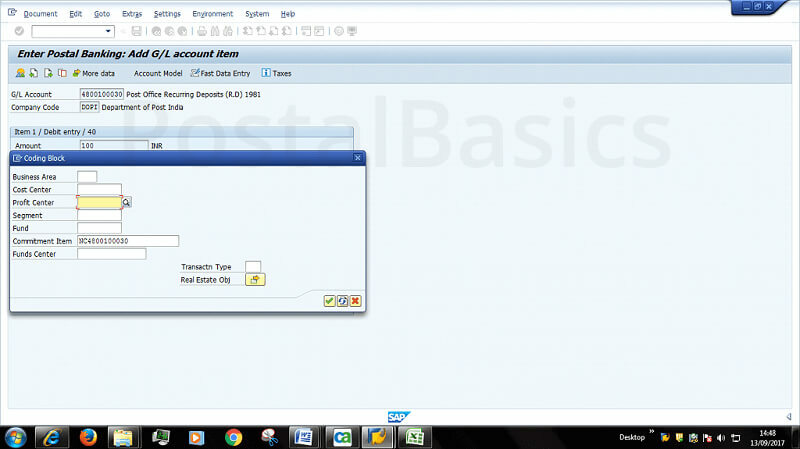 This is how you can create Check Liability within the office for any payments. If Sub Offices are making a payment through cheque then, they have to do one more step along with above mentioned procedure. 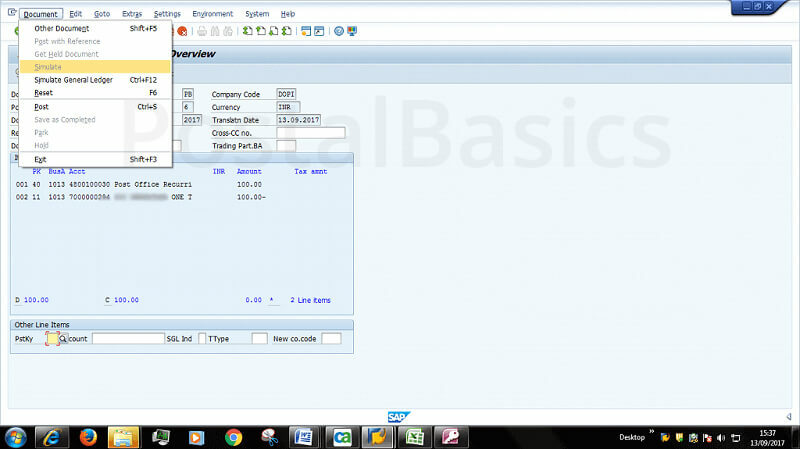 After the completion of the above mentioned steps, go to SAP main screen. Enter T-code ZF110. Below image will pop up. Document No. Enter the generated 10 Digit No. Now, SPM has to release this request. 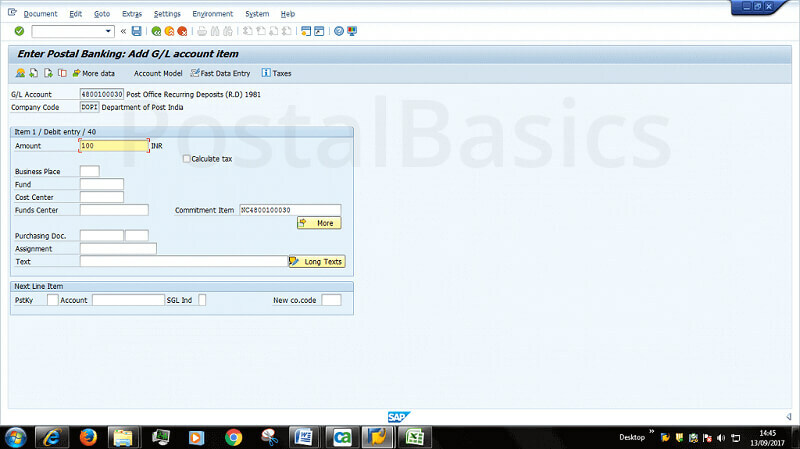 So, go to Inbox (SPM inbox) » Workflow » Click on Cheque Request Message » Release and type some message. Thus cheque request will be going to the concerned Head Post Office/LSG Office. Further process will be carried out at HPO/LSG.